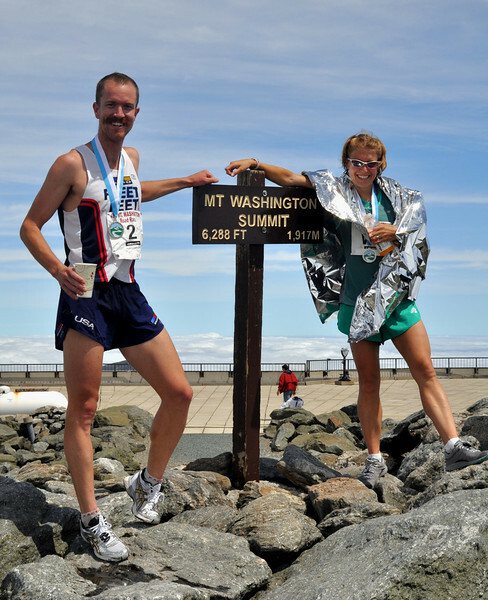 Rickey Gates, of Boulder, Colorado & Brandy Erholtz, of Bailey, Colorady, enjoy the view atop the highest peak east of the Mississippi, after winning their respective divisions, in the 49th Mt. Washington (NH) Road Race, held June 20th, 2009. Mr. Gates won the mens division with a time of 59:58, and Ms. Erholtz won the women's division (which she also won last year) with a time of 1:10:53.